Preheat oven to 180°C/350°F. Add soy sauce, some white almond butter, some lemon juice, rapeseed oil, toasted sesame oil, maple syrup, garlic, hot ground paprika, and ground cumin to a blender. Blend until combined, set aside. Remove stem and leaves from cauliflower, but keep any crisp leaves and set aside. Transfer cauliflower to a bowl. Add some marinade to the bowl and brush cauliflower with it until it’s coated. Transfer to a baking sheet and bake at 180°C/350°F for approx. 50 min. Add cauliflower leaves to remaining marinade and toss to coat. In the last 10 min. of baking, put marinated leaves next to the cauliflower on the baking sheet and roast them together. Chop cilantro, parsley, and mint. Finely slice green onion and save some of it for serving. Add one fourth of the soy yogurt and cilantro to a blender and mix until combined. Transfer to a bowl and add remaining soy yogurt, parsley, mint, green onions, lemon juice, remaining white almond butter, and lemon zest. Season with salt and pepper to taste and stir to combine. Once the cauliflower is baked, quarter it. 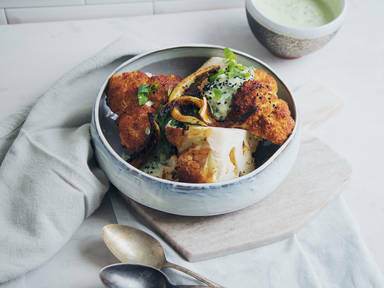 Serve with yogurt dip and baked cauliflower leaves. Sprinkle with remaining green onions and black sesame seeds. Enjoy! You can find plenty more dishes in Sebastian's new cookbook “HEFTIG DEFTIG" (SüdWest Verlag)!